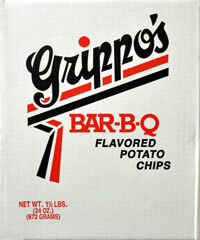 Grippo's BBQ Potato Chips 1.5lb Box contains 1 bulk bag inside the box which contains 20 ounces of Cincinnati's famous Grippo's Bar-B-Q flavored potato chips. This bulk box of BBQ potato chips is great for parties, family picnics, or just munching around the house. Be sure to buy more than one because once you start you can't stop. 4.3 average based on 9 reviews . These are to die for!! So addicting. Box wasn’t even out of the shipping box before the kids had them open! They were fresh and delicious! You guys alway hit the spot, I’m 37 and a in the Navy so it’s always good to have a little bit of home while you’re sailing the ocean blue! Thank y’all for all you do.